If I had a nickel for every time I walked into a restaurant and thought, “I’d love to talk to some of these people, but not face-to-face because that would be terrifying!” I’d have no nickels. 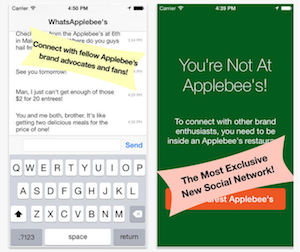 But one fan of Applebee’s thinks it has the app for those people — it’s called WhatsApplebee’s, which is essentially WhatsApp with an “lebee’s” on the end, obviously. To be clear, WhatsApplebee’s is NOT Applebee’s product, it’s just the work of someone who either really, really likes Applebee’s or is pulling one over on all of us, notes The Wire. And it only works when you’re inside an actual Applebee’s, though it’s unclear if you’re limited to just that cutie in the corner of the location you’re in, or some random guy across the country enjoying his fiesta chicken salad or sizzling fajita whathaveyous. It’s free to download as of now, but only for iOS. Sorry(? ), Android-using Applebee’s lovers.